In this no-nonsense chronicle of life inside Abu Ghraib prison, first-time author Griffith describes the aftermath of the abuse scandal and the soldiers stationed there afterward. Most enlistees in the 152nd Field Artillery Battalion never expected to leave the United States, much less serve in Iraq. Yet suddenly, in early 2004, these members of the Maine National Guard were dispatched to Abu Ghraib prison. Former Marine Corps combat correspondent Griffith describes constant confusion as they struggled to find their equipment when they first arrived and failed to understand why an artillery unit should guard prisoners of war. Worst of all, they took command of Abu Ghraib shortly after photos of torture victims incited global outrage. Griffith focuses on a handful of servicemen, but his protagonist is William Thorndike, known to everyone as “Dizl.” From the first pages, Dizl seems mature and wise, capable of bringing a fresh perspective to an ugly environment. 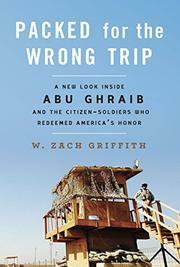 “Overall, Dizl thought, there was something slap-dash and contingent about Abu Ghraib,” writes the author. “It reminded him less of a functioning detention center than a semi-successful refugee camp thrown up in the first few weeks after a disaster.” Griffith’s writing is energetic and conversational. He takes pains to illustrate the wartime experience, describing how bullets actually tear through bodies, how time slows down during bombardment, and what soldiers talk about during endless days in brutal heat. Even as vengeful insurgents showered the prison with mortar and rocket fire, Dizl and his comrades attempted to improve the filthy living conditions at Abu Ghraib. The author ably describes the delicate relationship between the Iraqi prisoners and their overworked captors. He expresses admiration for the soldiers and their courage, but he also lambastes the Iraqi invasion and all the damage it caused. Veterans like Dizl did a lot of admirable things, Griffith asserts, but at what cost? A tough and vivid account of war and redemption.